I had been having some trouble keeping the humidity at the proper level of 70%. 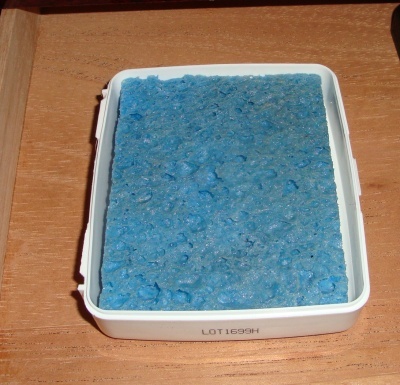 I bought an extra sponge, but I was having trouble keeping mold out of it. The local cigar store sells a glycerol mixture that is supposed to prevent this, but I found the stuff rather expensive. A couple of weeks ago, I was smoking cigars with my friend Fintan, and he showed me his DIY humidor. 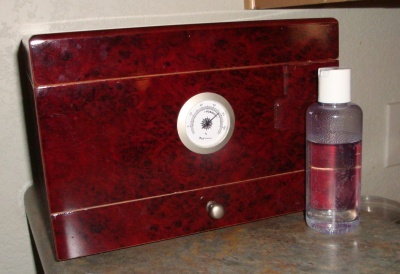 Fintan made a giant humidor out of a 30-gallon cooler by screwing cedar planks into the sides, and he made an equally large humidifier out of a tupperware and a sponge. What I brilliant idea! I decided to copy him, so here is my much, much smaller example. The bottle you see in front of the humidor is a mixture of 30% IPA and 70% filtered water. I needed something to keep the mold and whatnot out of the sponge, and that is what Fintan uses. The sponge is sitting in the bottom of a $1 first aid kit from Target. I had to trim the sponge a bit, but it fits nicely, and it holds much more liquid than my previous humidifer. I hope for better results.